What advice can you give a typical city girl interested in the job? Maybe start off on a property that's not that far from the nearest town and gets mobile reception. DO NOT watch McLeod's Daughters. Or if you do, believe the opposite to everything that happens. For example hot next door neighbours that you run into every day is in fact dirty old men that you see every now and then. It's great if you like your own company! What city are you from? Give it a go!!! Best decision I ever made. I'm still a govie and I love it. Be prepared for a challenge! Prepare yourself for the isolation - your day-to-day friends probably won't call you every day, most likely only one or two will call you once a week. Make sure you have one good person you can talk to about anything with... even if it's your mum. Learn to give yourself manicures/pedicures. People might laugh at you but sometimes it can just brighten your day. It isn't just 8 til 3, it is a 24/7 commitment. But it is ten times more rewarding than an 8 til 3 job. Maybe start somewhere in NSW so its easier to get home for school hol's. It can get full on living so closely to another family sometimes you need that time out with your own. Do it I was 18 when I moved to a station over 1000km away from home! I was a typical city girl when I left did 2 years straight and after 12 months off have gone back to my 3rd year with the same family! Life is full of opportunities so take them! Also, stock up on chocolate. Sometimes, you REALLY need it. Don't be afraid to give everything a go, as a city girl you will see things and encounter things that you never thought you would. Embrace the job and lifestyle and lap up everyday...also if you do go for it; stick to it and see it through. People from the country highly value people sticking to their word; and so many girls come out and leave after just a couple of months. You will love it no doubt; truly the BEST job in the world! Yes, even if you're trying to lose weight, you need comfort from somewhere! So chocolate, chips. I've travelled a lot before this job (I'm from Adelaide) and even so I'd never mustered sheep, picked up lambies, shot guns, ridden motorbikes etc... Now I have!! As above. Realise that your friends at home are just that. Reach out online to the governess groups and make a great circle of new friends. Get involved with your school and go to all events with your boss or families as you get to know them. Also try and go on a property with other workers on so there are more people around to talk to. On a serious note: you will not have a better social life then in the outback. Its better because it is bigger and because it doesnt happen as often, the catch ups go longer (camp drafts and races) and everyone is so friendly and excited to see each other. Aside from the social life, it is such an oppurtunity to see some beautiful country, become part of a family, and best of all, meet a whole range of people. Plenty of city folk have come outback and never left. Not to mention that the first step is wanting to give it a go! Put yourself out there too- ask your boss of any other young people or govies in the area. They usually know a few. It ain't like McLeod's Daughters!! Do your research! Find out EXACTLY what they want make sure it is in your contract and if they start changing it without discussing it remind them of your contract. Can be hard work but is one of the best experiences I had and the fondest and some of the funniest and strangest memories. Learn to get your hands dirty! Need to be able to drive a manual car and have your First Aid! Salary Recommendations - Do you pay a fair wage? Unless otherwise indicated, the images and content of this blog remain the property of Bushgovo and Governess Australia. Should you wish to use an image or story (or part-thereof) you must gain permission – contact me on govaust@governessaustralia.com. 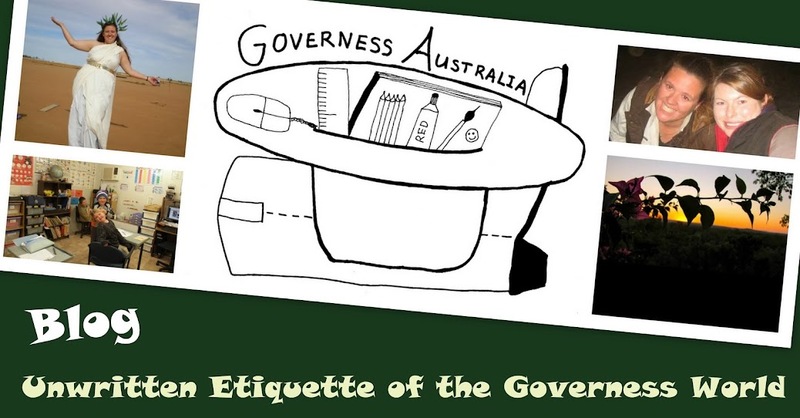 For permission to reprint contact www.governessaustralia.com THANK YOU. Awesome Inc. theme. Powered by Blogger.